Each issue of The SPS Observer contains interesting feature articles, advice from experienced voices, chapter and zone activities, physics problems, society news, announcements, and meeting notes from SPS reporters. It is published in hardcopy format and published online quarterly. Subscriptions are included with your annual SPS national membership dues. Please keep your membership profile up-to-date to ensure delivery. This brightly colored brochure introduces prospective SPS members to the benefits of joining the national organization. A packet of brochures is mailed to each SPS chapter at the beginning of the academic year. 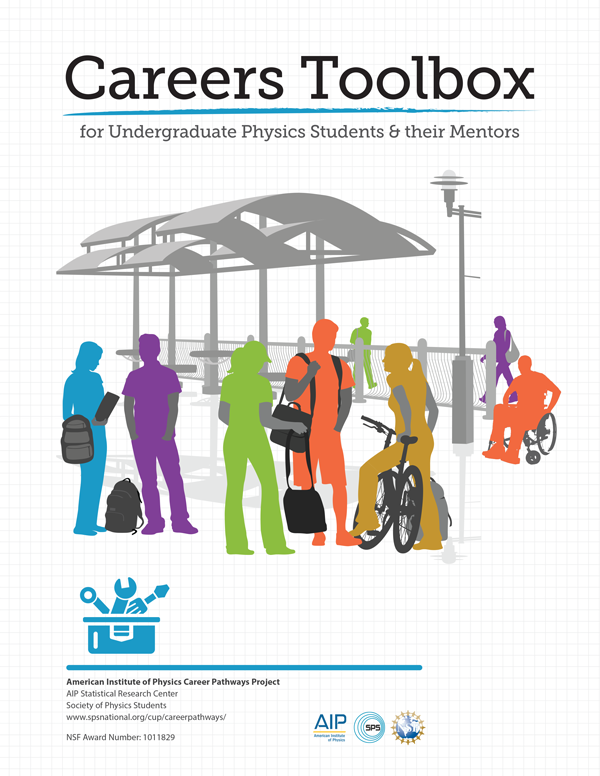 The Careers Toolbox for Undergraduate Physics Students is a set of tools and exercises designed to help undergraduate physics students prepare to enter the science, technology, engineering, and mathematics workforce. Tools range from exploring the common job titles of physics bachelor's to preparing for interviews, and are all geared specifically for physics students. This poster, created by the Career Pathways Project, is a summary of SPS's Career Toolbox workshop. It summarizes alternative education and career paths to the traditional academia or research options that physics majors should be aware of. Various quantities can be ordered on the SPS Store. 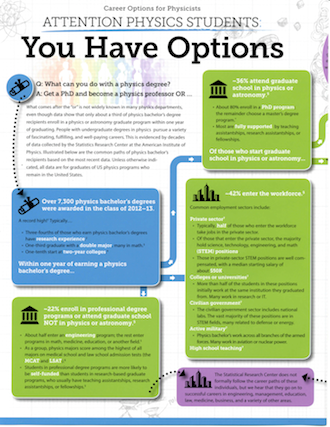 This guide, created by the Career Pathways Project, is a resource designed to enhance the work being done by career services professionals with physics undergraduates and faculty. The Fact Sheet includes information on the common career paths of physics bachelor’s recipients, resume and career advising tips, suggested databases for finding physics-related internships and jobs, and more. The Fact Sheet may also be useful for high school guidance counselors and college admissions staff. An introduction to physics and your world from the American Institute of Physics. This colorful brochure describes the role of physics in society, and presents information on education, careers, and additional resources to learn more about physics and science. 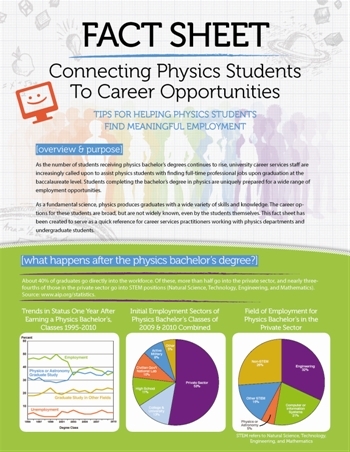 A great resource for recruiting high school and undergraduate physics students. Sets of 100 brochures can be ordered for $100 on the SPS Store. This poster can be ordered free of charge by contacting the national office, or you can download a high-resolution version (.jpg) from the SPS Dropbox site and print a copy locally. This annual handbook is designed to give chapter officers and advisors the key information they need to help their chapters get the most from its SPS experience. A copy is mailed to each chapter advisor at the beginning of the academic year. Arriving in your advisor's mailbox in January 2018. This packet of information contains helpful resources for your SPS Lounge and for use in advising. Use the links below to download .pdfs of all of the materials. Arriving in your advisor's mailbox in September 2018. This packet of information contains helpful resources for your SPS Lounge and for use in advising. Use the links below to download .pdfs of all of the materials. New year, new resources! We are counting the days until PhysCon 2019 and hope your chapter is too. Share these resources with your students and department to help get the word out. Click the links below or on our Publications page to download and print additional copies. Help students of all ages explore gravity and astronomy concepts with the latest SPS Science Outreach Catalyst Kit, or SOCK! Awarded to SPS chapters on a first-come, first-serve basis among eligible requests.